So. My friend told me about a fine and fancy summer meal. Plus she said it was super easy peasy...which appeals to me. Anyway. She said that all you do is take some French bread, sliced turkey meat, tomatoes, Swiss cheese and some pesto...layer them all together and then broil them 'til they get all toasty and melty. I decided it sounded like a very good idea. I tried it out soon after. 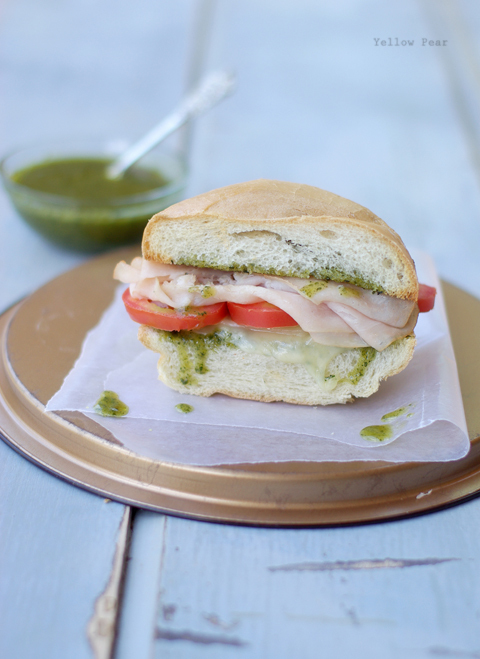 Miss B was skeptical about pesto on sandwiches instead of pasta. She thought it sounded horrific and asked if her and her friend (who was over) could have their sandwiches without pesto. I asked her to come taste the pesto...and her friend too. So they did...a bit apprehensively. And immediately their eyes lit up and they licked their lips and Miss B said, "Mmmmm, it looks like frog spit, but it sure tastes good." And that, my friends, is exactly how the story went. Plus everyone ate every last crumb. And they requested more pesto for dipping. Except Q who ate everything but the bread. Weird kid. Who doesn't like carbs? PS I love the Knorr version of the packet-variety pesto. It is the tastiest I believe. Looks nummy, Lou-Lou. :) I was just about to ask, 'Where in the world do you GET pesto, or how does one make it? ', welp, now I know! But I'm siding with B, it does look like a frog gleeked on your sandwich. Heeehee! Hey! I just bought some Knorr pesto sauce thinking I would most likely use it! I will be eating frog spit sandwiches tomorrow!